Comic Book Review: Black Panther & The Crew #1 by Coates, Guice, Hanna, Brown, & Sabino – A masterful, densely-layered first chapter! Some people say “the art spoke to me,” but how often do they say, “the art made me speak”? That’s how I felt about this week’s Black Panther & The Crew #1. My original plan was to give this new Ta-Nehisi Coates and Butch Guice Black Panther spinoff a quick read and a one paragraph review as part of keeping up with new Marvel titles. 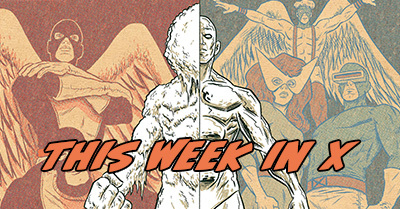 I had no concept of how incredibly strong and thought-provoking of a comic it would be. In that regard, it feels of a piece with the nuanced first half of Netflix’s Luke Cage. The issue was so layered and powerful that words started spilling out of me before I could even finish reading. I was desperate to unpack all the thematic content. I couldn’t stop talking about it on Twitter, Facebook, or in the house with E.
As a result, this is as much as review as an attempt to identify and parse the several layers of identity and privilege in this story. I’m a white man writing about a comic by a black writer about black women and their community. I make no pretense that I’ve got the right, best, or even relevant take on the issue – but, this comic moved me, and I think it’s a mistake not to write about art when it makes you speak. I’m probably going to get some things wrong. I offer my apology in advance for that, and I’ll offer it again in specific if you point out where I am mistaken. One of the best parts of this comic is yet to come. No, not the appearances of Black Panther and Luke Cage. 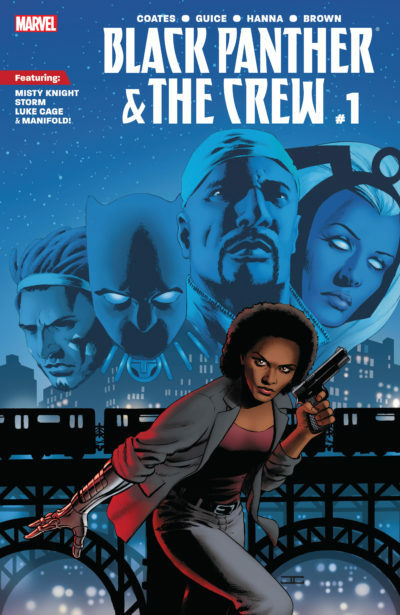 The even-numbered issues of The Crew will be scripted by poet Yona Harvey – one of the few times Storm has ever been written by a woman, and the first in-continuity arc with her written by a black woman. Ever. Written by Ta-Nehisi Coates with pencils by Butch Guice, inks by Scott Hanna, color art by Dan Brown, and letters by VC’s Joe Sabino. Cover by John Cassaday with Laura Martin. Black Panther & The Crew #1 is dense with symbolism and thematic content, deliberately using its visual medium to create juxtapositions that would take many more pages to work through in a prose version of the story. I haven’t yet read Black Panther by National Book Award winner and Atlantic correspondent Ta-Nehisi Coates, but the first issue of Black Panther & The Crew tells me I need to go back and catch up immediately. I don’t know why this comic’s unwieldy title can’t just be “Misty Knight,” but I’m not going to look a gift horse in the mouth. Black Panther never appears. Coates uses Misty as a narrator to great effect, forcing the reader to pause to absorb the panel work as her narrated story frequently departs from the action we see in the art. Maybe the point-of-view character will rotate as the series progresses. Misty’s story is really the story of Harlem, and of Ezra Keith. Keith is a former costumed crime fighter turned into a frequent anti-police protestor, though Misty has only put the connection together recently. 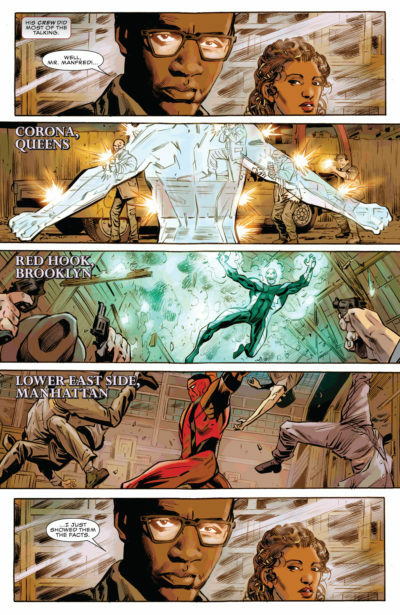 While Misty’s thoughts are on Keith’s case, Butch Guice’s artwork is elsewhere – first depicting a flashback of Keith leading his own Crew (called “The Crusade”) in 1957 and then showing Misty wading through a crowd of present day protestors as they clash with both local police and state-issued police-bots. It’s not until Misty meets with Storm later in the issue that her thoughts and the images line up. It’s a powerful choice to snap the story fully into the present tense at that moment, even before Misty and Storm exchange their first words. It sets them up as peers, black women, community members, and heroes – but each with her own distinct stack of privilege acting as a filter. Misty feels a connection to the community and their protests, but can’t help but keep them at a bionic arm’s length. When she sees something amiss in the death of an elderly citizen, her first instinct isn’t to protest or offer counsel. The issue treads a careful line of whether that’s due to her skill as a detective or if it is her privilege as both police and superhero to enjoy a detachment from the immediacy of state-sanctioned violence against her community. The violence angers and disappoints her, but she can wade through a police line to visit the other side with impunity – at least, for now. The comic is less equivocal on how that privilege is also double-edged sword. It’s hard for Misty to relate to her fellow officers, both as a member of the community and as a superhero. Misty has tried being a member of the community the police serve, a member of the police force, and someone stronger than them all, but no matter what role she takes on she endures a litany of micro-aggressions reminding her she’ll never really be just one of the cops again. How much of that is down to the fact that she didn’t take her lumps when her arm was destroyed – instead accepting the aid of a superhero to reject becoming a disabled person? Not all other officers get that choice. [Read more…] about Comic Book Review: Black Panther & The Crew #1 by Coates, Guice, Hanna, Brown, & Sabino – A masterful, densely-layered first chapter!